The 100 HIIT Workouts is a collection of high intensity interval training routines suitable for all fitness levels designed to help you integrate exercise seamlessly into your everyday life, get you fit and help you stay that way and do it in half the time it would normally require. All workouts in this collection are time-based and can all be easily adjusted to fit your schedule. Some routines will take 35 minutes to complete and others need less than 10 minutes. This collection is complete and it is absolutely free - no strings attached. The project is supported exclusively via donations, we have no sponsors or ads on this website. If you like this collection, please consider donating a dollar to help us support and maintain this resource. 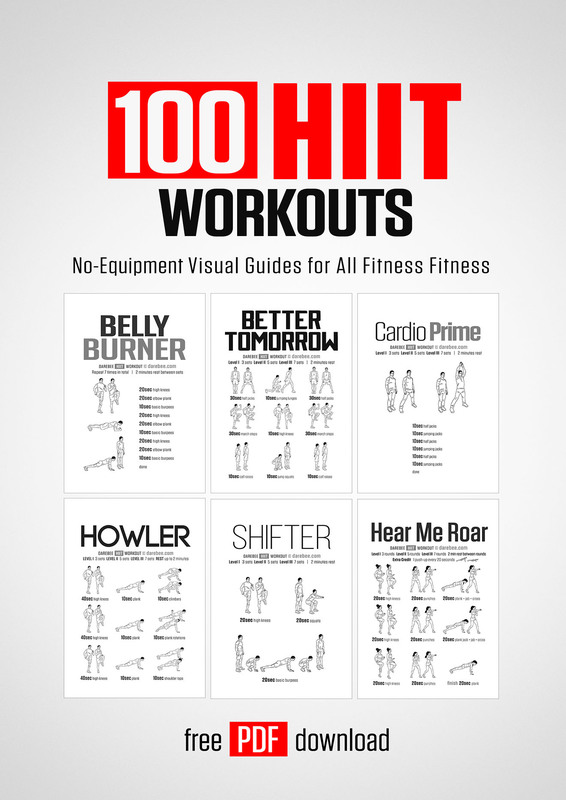 All of the workouts from this collection can be found in our workout database. A paperback option is available from any local bookstore or from Amazon.com or Amazon.co.uk. Paperbacks always contain the same information already available for free on this resource. It is also an easy way to introduce someone else to bodyweight training offline. When you buy a paperback you pay for printing and store fees, DAREBEE only makes $1 from each sale. That money goes directly into our development and maintenance fund.